This CD is out of print, Pressy noted. He’s had TWO volumes in the past. Let’s hope he records again! 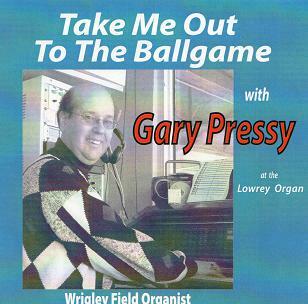 Gary Pressy might be the Charlie Brown of team organists. Legend has it that he lobbied the team for eight years before he landed the gig. In 2010, Cub players asked for pre-recorded song clips instead of Pressy’s organ for “entrance (at-bat) music.” Thankfully, fans rallied to his aid, circulating online petitions. For 2,000 games, he’s waited to be part of a World Series. Now, I misspelled his name! I’m sorry. Wayne Messmer sang the National Anthem at the only Wrigley Field game I attended. I’ve loved his renditions on the radio, too. Pressy’s thoughts? “I agree Wayne is the best. He and I are like brothers and grew up 4 blocks from each other. (What a small world.) Patrick Blackwell is an excellent singer and his rendition of God Bless America is great. Pressy accompanies for Take Me Out to the Ballgame. He saw Harry Caray croon for crowds many times. What’s his favorite Caray memory? “Once again, thank you for your interest, and here’s hoping the Cubs will play well into October next year. Let’s hope that Pressy is there at the keyboard for each of those dream games! Don’t forget to see Pressy’s Q&A with the Chicago Tribune this season! Coming Friday: Learn how Phillies fan Gregg Kersey turned an old ballpark seat into an autograph adventure.